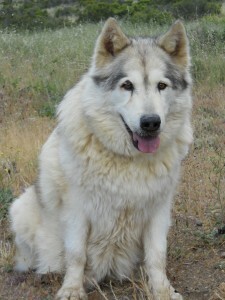 Omak was a gentle giant and Alpha of the pack until March 2019. He was abandoned by his owner and taken in by a neighbor. Unfortunately, Omak escaped and roamed the neighborhood and hillside for a few months despite animal control’s efforts to catch him. Eventually, Animal Control did confiscate him and wanted to euthanize him because they feared he was too aggressive. 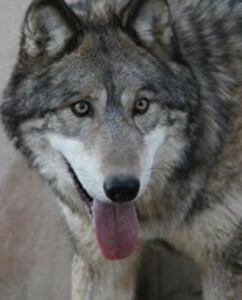 Omak was darted, caught, placed in a metal box and driven five hundred miles to reach Wolf Connection®. Needless to say he was not very happy when he arrived…..After a few weeks, he began to trust. There seemed to be an overwhelming sense of loneliness about him….Staff soon realized that Omak was not accustomed to receiving loving touch. 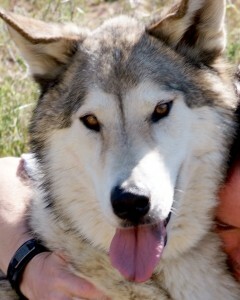 Slowly and surely, he began giving and receiving loving nuzzles and became an amazing Leader to the pack. Omak’s cancer diagnosis in 2018 resulted in an amputation of his front, left leg and gave his pack the gift of 5 healthy months with our beloved Alpha. During this time, Omak and rising Alpha, Kenai, spent much time communing through their habitats and mirroring each other in howl. A good Alpha knows that the health of the pack depends on his ability to prepare the future Alpha for the challenge. 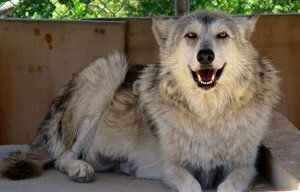 When Ozzy came to Wolf Connection, he found “home”. Ozzy was rescued from death row at a shelter. 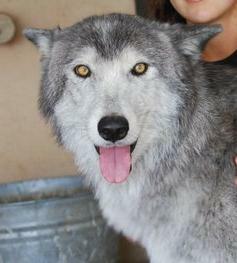 Because of his wolf content he was immediately slated for euthanizing. 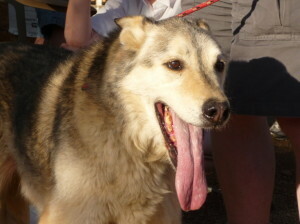 Luckily, someone from the shelter knew one of our volunteers and Ozzy joined Wolf Connection. When he arrived, he was malnourished and suffered from infected skin conditions. He is fully recovered and was healthy and full of love! He was known for his dreamy green /golden eyes. When out hiking, he had a penchant for stopping and taking in the vista. Often, staff wondered what he was thinking during those moments. He taught his handlers to stop, take in the scenery, and just be. 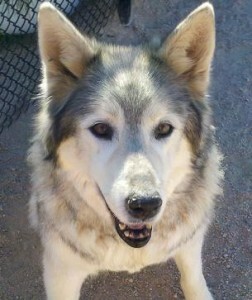 When Ozzy transitioned, his heart just kept beating slowly and faintly, but strong – the heart of a wolf. 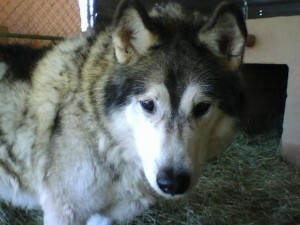 Maya, an original pack member, was the quintessential alpha female: She was the wise teacher. 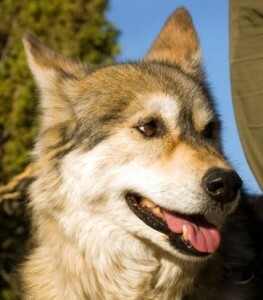 Maya spent her first few years reared by her mother ensuring that she would learn the way of the wolf. 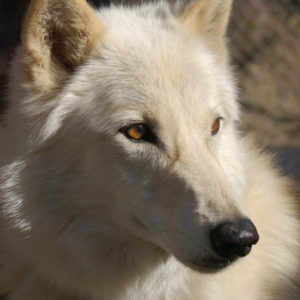 As a result, one of her gifts was to nurture new pack members when they join Wolf Connection. 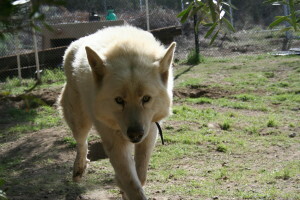 Several of the younger males were kenneled with Maya who quickly instructed them in proper wolf etiquette. Maya also exhibited true alpha behavior: she simply WAS alpha. She didn’t have to prove it. Her presence was as serene and expansive as one might imagine the silence of the Arctic to be. During the summer of 2012, while visiting the 13 Indigenous Grandmothers in Lame Deer, Montana, her sacred spirit joined the festivities as she was heard to howl, often alone, during times of prayer and ritual. 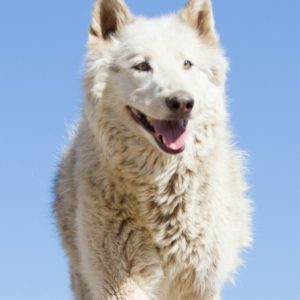 Her howl, and the rest of the pack that joined her is said to have inspired the return of the wild wolf to the Cheyenne people. 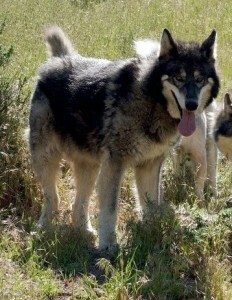 Chance and his brother Koda are high content wolf dogs that joined Wolf Connection after having been rescued from a roadside attraction in Alaska. The State of Alaska condemned the attraction and criminally charged the owner and ordered the twenty-six wolves to be euthanized. Chance suffers with anxiety after enduring years of life literally tied to a post with a chain around his neck so that people could pay money to drive by and throw treats. 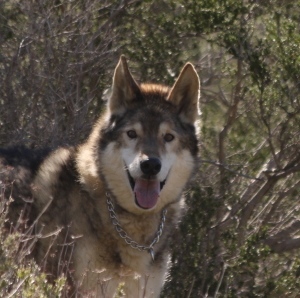 During winter the chain froze into his fur and eventually grew into the skin of his neck rendering him sentenced to walking in one direction so as not to rip the chain through his skin…..Despite Chance’s fear at the sight of man-made objects and the physical neglect and abuse he endured, he has learned to walk on leash. He is full of love and he shares it. In fact, the very strong-bodied Chance is affectionately known as the Linebacker of Love! 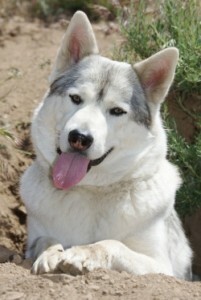 He tackles staff with playful kisses and bosses around his younger sibling, Koda, as big brothers do. 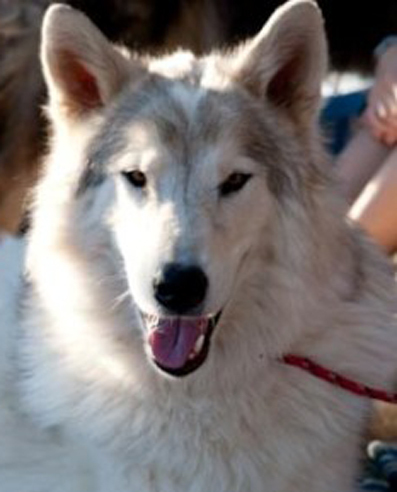 An original pack member and brother of Rocky, Zimba was one of Wolf Connection’s first program animals and wolf ambassadors as he has a strong love of people, making Wolf Connection what it is today. As he got older, he dealt with some health issues that “retired” him as a program animal but he was still a wonderful ambassador, greeting everyone with his regal stance. Zimba loved to go out on walks with staff with whom he bonded. Show him the leash and he, despite his physical ailments, would run around the kennel with joy! He loved to go down to the creek and splash in the water with his brother Rocky. With soulful eyes, he is truly to be adored, admired and missed. 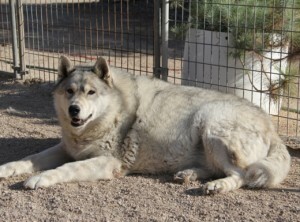 Tala is the co-founder of Wolf Connection! 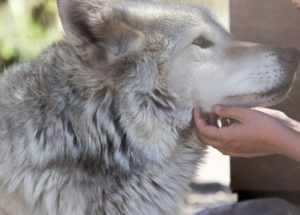 She warmed the hearts of all she met and was usually the first face they saw when entering the Wolf Connection Ranch, our official greeter. 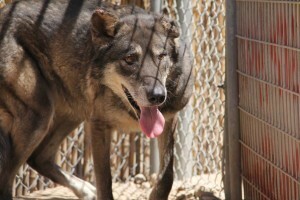 Before Wolf Connection started, Teo Alfero, the founder, was searching for a playmate for her and discovered 16 wolfdogs in need of a home from a dire situation. Tala then inherited an entire pack, who then became the 16 original pack members, and Wolf Connection was born! That event changed Teo and Tala’s lives. 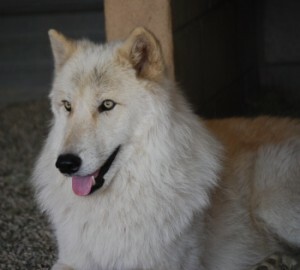 Tala now rests at the new Wolf Connection Ranch, overlooking the pack she created and welcoming those who are about to have their lives changed forever. 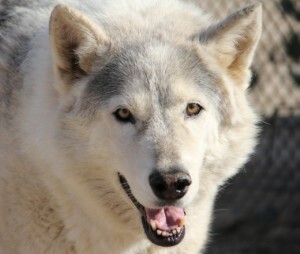 The loss of Tala is incredible, but the gift of her presence continues , she is our guide and her dream is our mission! 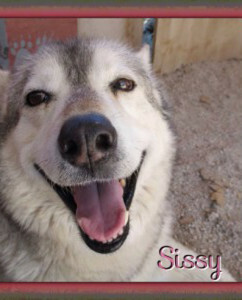 Sissy joined Wolf Connection along with Shadow following the passing of her owner. When she arrived, she was obese and could barely walk. After starting a diet catered to her needs, she released about 90 pounds and is now a vibrant elder over the age of 14 years. She has quite a loving and feisty spirit that keeps her going strong.